I'll start with an apology, because I was sent this book for review last summer, and I listened to it, and enjoyed it, and somehow the review never got written. I only discovered this when I saw the second book was out, and went to look at my review and see what I'd thought of this one. No dice. I must have gone on vacation. So here it is, better late than never. Publisher: Audible, 2016. Paperback by Camel Press, 2016, 240 pages. Publisher's Summary:Private Investigator Edwina “Eddie Shoes” Schultz’s most recent job has her parked outside a seedy Bellingham hotel, photographing her quarry as he kisses his mistress goodbye. This is the last anyone will see of the woman … alive. Her body is later found dumped in an abandoned building. Eddie’s client, Kendra Hallings, disappears soon after. Eddie hates to be stiffed for her fee, but she has to wonder if Kendra could be in trouble too. Or is she the killer? My Review: This is a well-crafted mystery, with characters I enjoyed. Eddie is a nice mix of confidence and insecurity, and while I sense that there will be more romance in later books, the mystery--and the relationship with her mother--absorbs Eddie's attention here. As with many first books in series, the cast and the setting feel a little constrained--not too many characters, and my feel for the town is okay but not detailed. That's fine--I think it's easier to get into a series as a reader (as well as for the writer) if there's not too much in the first book. The characters we do have are necessary, well-developed, and seen through Eddie's eyes, so not always quite as they appear. The author manages in some cases to give the reader a sense of seeing more than Eddie does, even with the 1st-person narration--a good trick. 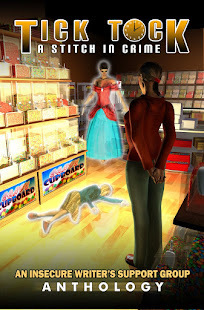 The mystery itself is interesting and entangled, though the actual corpse gets left a little behind (who killed the mistress mostly feels secondary to the rest of the issues). I felt on second listening that the clues were there, and Eddie neither got them handed to her nor ignored anything that was right in front of her face. The audio production is excellent, and I think the narrator does an excellent job. She didn't get really tested on the tougher regional names, though :) However, the characters are voiced well, and distinctly, and production values are high. 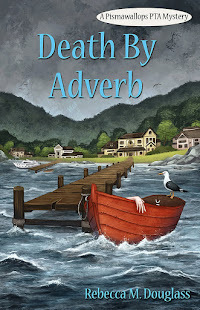 An enjoyable PNW mystery, set (I have to say it) just across the water from my own Pismawallops Island. If you enjoy character-driven mysteries, and especially if you like the PNW setting, check it out, as a book or an audio book. 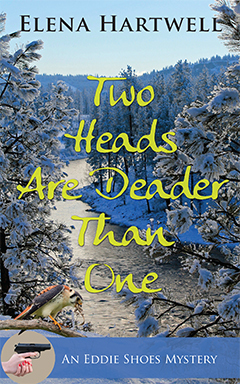 And keep an eye out for Book 2, Two Heads are Deader than One. I'll be checking it out. 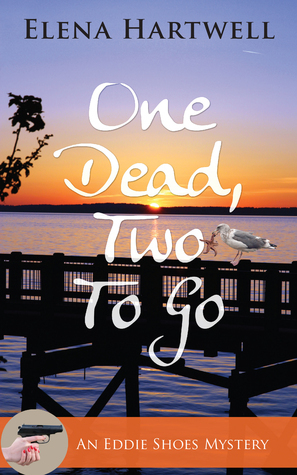 FTC Disclosure: I was given a free review copy of the audio book of One Dead, Two to Go, and received nothing further from the writer or publisher in exchange for my honest review. The opinions expressed are my own and those of no one else. I am disclosing this in accordance with the Federal Trade Commission's 16 CFR, Part 255: "Guides Concerning the Use of Endorsements and Testimonials in Advertising." Yup. Not sure what happened that I didn't review it right away. Sounds like a fun mystery! I liked the character development, and the mother-daughter relationship.